Million Dollar Marketing Blog: Top Bollywood marketing budget and promotion:the evolved bolly era continues. Top Bollywood marketing budget and promotion:the evolved bolly era continues. The biggest billion dollar budget Bollywood movie RA one is going to release on the month of October but it has already started its heart cracking promotions now only...so can't wait anymore for the movie...its really a rewriting of marketing and promotional strategies. lets hop back to our topic of late 60's and their strategies that's not working any more on the wall and on the top of the colored banner. But since then it has emerged dramatically, we MBA guys always talking about STP’S, BRANDING ,POSITIONING AND ADVERTISEMENT MARKETING etc. which is now a major factor of consideration in the recent Bollywood also. Here is a detail of movie budget of different cinemas and their marketing budget. Market whopping movie 3 idiot starrer Amir, madhavana and Sharman. 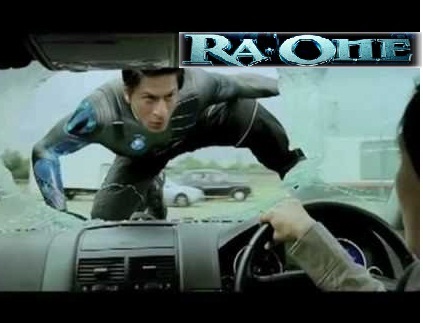 Recently Ravan Ra one starrer saha rukh khan is coming with bumps in this dewalli. It would be the highest ever movie deal in the Bollywood.it starring king khan,kareena kapoor,Arjun rampal etc. You can see here and there also how Bollywood roping to its target audience with different promotional marketing strategies.it generally included television advertising, ambush marketing ,viral marketing ,multiplex promotions, tie up with several well-known brands and merchandising. While competing with their Hollywood counter parts Bollywood recently comes up with 3D PC games and various mobile applications. If you will see with a micro sense around 10% of a HINDI/BOLLYWOOD movie’s budget is generally spent on the pre-release activities like promotion and marketing. While recent data shows that it will likely to increase up to 20-30 % for big budget movies. While low budget movies also trying their level best on investing their major part of budget investment on pre-release marketing and promotion activities. It’s amazing to know that promotion of these Bollywood movies are done through using star-cast, star visits and songs give any HINDI movie the necessary publicity at minimal expenses. This modern era Bollywood included social networking (like twitter, Facebook, Ibibo etc. ),co-branding, special events and functions and at last special appearances in different TV shows like Indian idol, Hero Honda sare gama pa, laughter challenge shows etc. for advertisement and promotion. also able to raise the bar of standard with crore of income in the bag.